Issues • How can I buy a subscription for 1 year if I am a student. Cameras • Re: Kinect 360 vs Kinect XBOne? Cameras • Kinect 360 vs Kinect XBOne? New Members • Re: Supply list for a new user. Also, Eye vs Kinect? It looks like .NET framework is corrupted on your system. Try running .NET Framework repair tool. Actually, this make me wonder if the ExpressCard I got a couple of months ago for my laptop just needs a boost in power to run a second Kinect 2 at full speed. There is a socket next to the USB port for a power adapter; just hadn't thought to try powering it externally. Will have to give it a shot this week. Edit: 100% extends to where I need it to go!!! done with wire buying! woooo! Oh, it could also depend on the USB's port's power output. Some USB ports don't output much power at all so make sure the port has adequate power. If that's the problem, some cables let you attach an external power supply. I'm starting to think that power output could be playing a part in it too (but also quality of cables as well) since the 10ft active cable I bought from 10ft (Active) CableMatters/SayTayY is dropping 1.9 frames compared to my 9.8ft (Passive) AmazonBasics extension cable. I'm kind of hoping someone already has the cables to test with so I don't have to dive into the darkness. I'm also struggling to find a USB 3.0 extension cable that allows an AC Power Adapter that is compatible with a Kinect v2. I keep running into comments like the one below. 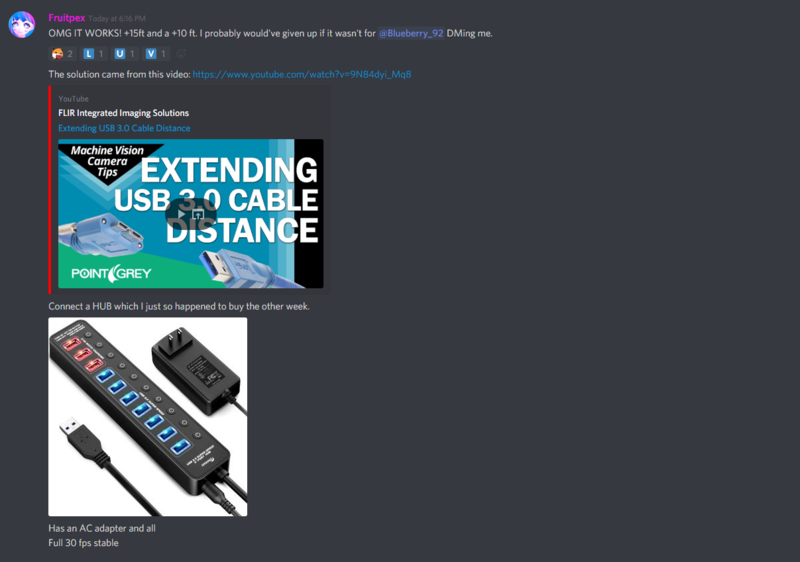 Editx: Turns out I bought a wire that can replace the original 5ft wire Cable Matters USB 3.0 Cable (USB 3 Cable/USB 3.0 A to B Cable) in Blue 15 Feet ( https://www.amazon.com/gp/product/B00821FO5U/ ) that's directly connected to the Kinect. It manages to pop out 30fps fully stable at 15ft but still my passive 9.8 ft AmazonBasics + active 10 ft Tay USB 3.0 wires are not detected at all. Although- if I think about it... the original wire is 5ft and the extensions are 10ft so that equals 15ft for both... so its exactly the same length. Maybe It's just not possible to extend past 10-15ft. It might have to do with the quality of the active cable. For me, some active cables work great for Kinect over long distance while others have been absolute junk. Be sure to go through user reviews to determine a cable's reliability. If the cables you have turn out to have a history of poor performance, send them back. I'd have to check what brand/model I'm using at home. I think I'm using Monoprice cables but can't swear to it yet. Will post again when I know for sure.